Are moisture and ultraviolet light from the sun causing trouble? Moisture and the ultraviolet light from the sun are the main contributors to damaged pellets. 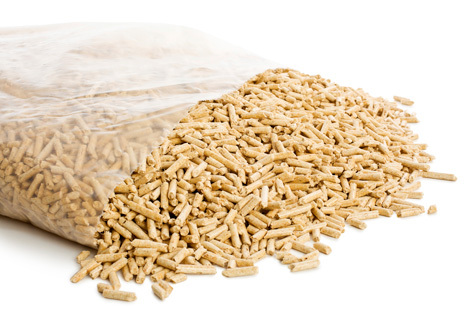 Moisture causes wood pellets to immediately swell and break down into sawdust. Test us to wrap your products…! Stretch hood pallet wrapping is the proper wrapping for bagged pellet loads. Being environmentally responsible, we know the importance of maximum load stability, a water resistant wrapping and a UV protected load. No need for extra wrapping like putting the pellet bags in corrugated trays and then stretch wrapping them, sometimes even twice with a 4 mill stretch wrap film in order to prevent material breakdown and weather damage. Simply apply a 100% waterproof UV protected stretch hood cover onto the palletized pellets bags and you are good to go. This quality packaging helps protect the pellets from breakdown and exposure to the elements.